This week, we thought we’d give you a little taste of what we find on a typical “scavenger hunt” for used office furniture in New Orleans. Be warned, by the time you read this blog post, these items may have already sold. Our inventory is always in flux as these pieces go fast. That’s not surprising since we offer them at a rate discounted 50-90% off retail. But you can always browse our current selection here. This credenza with its warm cherry finish and gorgeous paneling is a piece you would be proud to display in any area of your office. It could greet guests in the lobby, add flavor to your conference room or bring a touch of class to an employee break room. It features plenty of storage for everything from cups to creamer. 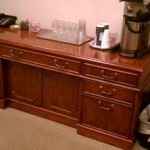 We don’t just source interior office furniture. New Orleans has the kind of climate that folks in North Dakota can only dream about. So we were excited to snag these wicker style café chairs. If you have any kind of outdoor access from your office space, make this the year that you create a little oasis for your employees. 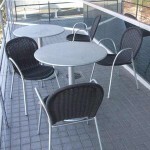 When people get to spend their first few minutes at work relaxing outside, this can set a great tone for the whole day. This cubicle really is in a class all by itself. We often purchase a whole fleet of cubes at a time, but this one was a loner. We’ve never seen quite this color combination before (burgundy trim and overhead bin, pale bluish/greenish/grayish panels and honey toned wood laminate). We admit that it probably won’t match anything else, but it would be perfect for a single unit space. With those high walls on three sides, it’s like a little private office. 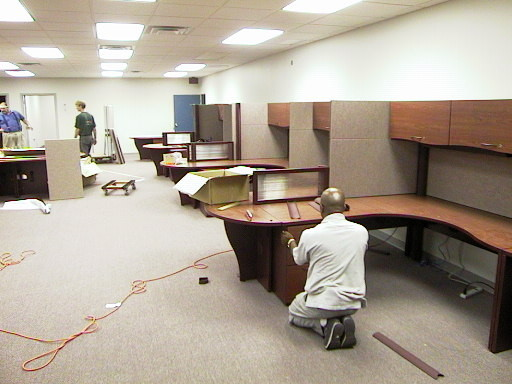 At the re-installation in Metairie, cubicles should also be assembled by a professional team. That way, you don’t end up with unstable workstations or leftover nuts and bolts. While some cheaper cubes are pretty easy to disassemble and reassemble, the higher quality brands that incorporate power and data cabling can be somewhat complex. In addition, wood veneered parts require a little extra TLC to prevent dings and scratches. 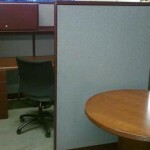 You don’t want to have your new office populated with cubicles that look like they traveled 500 miles by wagon train. Our professional Metairie cubicle installers are punctual, appropriately dressed, speedy, efficient, knowledgeable, friendly and thorough. Let The Office Planning Group help you plan your office move. We’ll help make sure your new space looks great! Is your business being well-served by its current filing systems? New Orleans is far from the most expensive city when it comes to commercial real estate prices. But that doesn’t mean you can afford to have a bunch of extra space sitting around unused 99% of the time. That’s what’s happening if you have traditional, static filing cabinets or shelving with aisles in between. This problem is most obvious in terms of square footage you could be using for other purposes. For example, consider how much more effective your space usage would be if you put in more workstations, an extra meeting room, an audio-visual conferencing space, or even an additional employee lounge? Wouldn’t it make more sense to spend space on people instead of paper? There are also hidden costs above and beyond the footprint of your filing cabinets and aisle space. Remember that you are also providing lighting and air conditioning for your storage area. If you are leasing your office space and could reduce the square footage you need to rent, you could save a pretty penny on these energy costs as well. Let’s say you are in the process of planning a new office building or expanding an existing space. Being able to work with a smaller layout means you require less building materials. That’s a cost-savings up front and a potential win from an LEED standpoint in the “developmental footprint” category. We’re actually not suggesting that you go paperless. We know that there are some industries and some situations where maintaining paper records is still necessary. But what we are suggesting is getting rid of empty space by using a high density filing system. This type of solution eliminates the empty walkways between rows of document shelving. The shelves are mounted on rolling carriages that are housed in tracks on the floor. Each shelf fits snugly against the one next to it. When you need an aisle, you simply turn a wheel mounted on the side of the shelving to roll them apart. Or, you can choose a remote controlled system to make things even easier. This is just one example of ways to save space with your filing systems. New Orleans customers and businesses in surrounding areas can always get in touch with The Office Planning Group for more great space planning and design ideas. Set up your free consultation today!